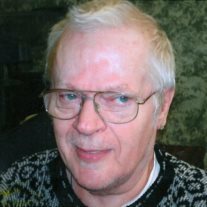 Frederick R. “Rick” Stahr III, 70, of Rock Island, Illinois, died Sunday, September 14, 2014, in St. Anthony’s Nursing and Rehabilitation Center, Rock Island. Private burial will take place at Moline Memorial Park. Trimble Funeral Home and Crematory, Moline, is handling arrangements. Memorials may be made to St. Anthony’s. Rick was born October 16, 1943, in Portsmouth, Virginia, the son of Frederick Jr. and Mary Ellen (Foster) Stahr. He is survived by his mother, Mary Ellen Stahr of East Moline, Illinois, a sister and brother-in-law, Julie and Gary McWilliams of Glenview, Illinois, and brothers and a sister-in-law, Gerald and Debra Stahr of Coal Valley, Illinois, and Timothy Stahr of Moline. Visit Rick’s personal tribute page at www.TrimbleFuneralHomes.com to share condolences with the family and light a free candle in his memory.